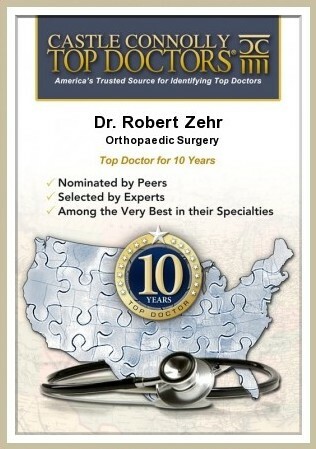 At the Zehr Center for Orthopaedics we believe that this practice is among the most advanced, patient directed orthopaedic practices in the state of Florida and we have many awards and testimonials to validate this claim. But we have no intention of standing still or sitting on our laurels. 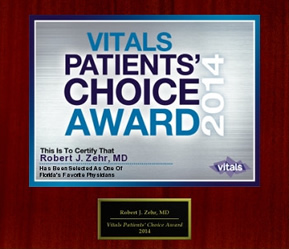 Dr. Zehr and his staff are constantly striving for excellence through self evaluation and directed improvement as medicine is an ever changing and constantly advancing profession. We can achieve this lofty goal only through the help and feedback of our devoted patients who offer constructive criticism or thoughtful praise; from which we either re-direct our efforts or which will motivate us to continue providing superior care that our patients deserve. To this end, we have set up this easy access point so our patients can easily access several of the nationally recognized physician and staff rating services which allow our patients to help not only us, but other patients who look to these services for guidance in a sea of medical providers. This is extremely important for our patients who visit us for short periods of time here in Southwest Florida, but may not know who is highly skilled and experienced in the services that they need. To assure that the feedback is from our actual patients, we have set up this password protected access point. Please enter below the username and password that were given to you at your last visit with us or by calling us at 239-596-0100. Our helpful staff would be delighted to provide this information to our patients.